Stepping off of the ski-equipped LC-130 Hercules aircraft at Williams Field on the Antarctic coast after the three hour flight from the Pole, the first thing I noticed was how the warmer snow felt under my feet. It was nearly 40 degrees below zero (conveniently that is where the Fahrenheit and Centigrade scales are equal) when I boarded the plane at the pole. I didn’t think much of how the snow felt under my feet, or what it sounded like. The squeaking crunching sound had been there all season. But when I set foot on the warmer costal snow, where it was right about freezing, the snow felt very different – soft and creamy. Four of my polie co-workers and I, plus a dozen scientists from the pole were on our way back to the land of green. Our first stop was a night in McMurdo. Not long after us, people leaving the pole will be able to fly straight through without an overnight layover in McMurdo. Instead of getting a ride to the base like we did, they would simply get off of the smaller ski-equipped LC-130 and be shuttled from the softer snow ‘skiway’ to the harder ice runway where the huge wheeled C-17 Globemaster III will whisk them straight to Christchurch, New Zealand. The latter is what veteran polies preferred, but I was happy to have some time in a different part of Antarctica. The terrain at the pole is flat. Very flat. Imagine a calm sea, freeze it, turn it all white, and that’s what the terrain was like in every direction for at least 1200 kilometers (800 miles) from the pole. 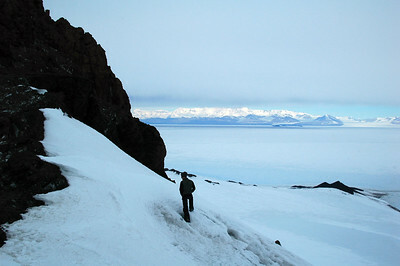 McMurdo however had a few interesting terrain features going for it. First it was right along the tremendous Trans-Antarctic Mountains. Ah, mountains. That was an excellent start. Adding to that was the active volcano Mt. Erebus with a convecting lava lake within its summit crater. This often caused a white puff to seep from the summit. Another geographical advantage is McMurdo Station is on an island, Ross Island, which is in McMurdo Sound, which is in the Ross Sea. As if they were running out of names to call things. Immediately adjacent to the station was a barren conical 200 meter hill called Observation Hill, or for short Ob Hill. With a few hours remaining before dinner, Tony, Derek and I were restless and keen to climb. The hike up was easy, especially considering we were all certainly riding high on the oxygen rich atmosphere at sea level after spending more than three months at over 3,000 meters. The view from the top was great. Not as good as it would have been under the clear blue skies we had when our airplane landed, but as the name implies it had plenty of height to observe the happenings around the station. When we returned to the station, we learned we didn’t have to check into our flight to Christchurch until two in the afternoon the next day This left us ample time to get out on a longer hike in the morning. The most substantial destination near the station is Castle Rock. Tony and I checked out a radio first thing in the morning and started the 8 km trip, working our way past the industrial mining camp like section of the station to the outskirts. For the most part, McMurdo is pretty devoid of snow. While it does snow there on occasion, the ground is mostly barren volcanic cinders and we were relieved to gain some elevation and get back on the snow pack. Along the way, we followed a well marked route with small flags on bamboo poles. The flags were placed so frequently it was like walking along a parade route or a trail of marching ants. While it seemed superfluous to us in good weather, the Antarctic coast is prone to instantaneous white out blizzard conditions. I suspect it would be hard to see from one flag to the next in the worst of weather. Dividing the trip into thirds were little warming huts with survival gear. But these were not huts like your thinking. These huts looked like giant red apples – a red version of what Peter, Peter, Pumpkin Eater put his wife in. They also had an odd space-age sort of look about them. Tony and I took turns signing the guest book, happy to announce that some Polie GA’s were passing through and exploring this strange undulated land. Castle Rock came into our view as we crested a gentle ridge about halfway along the walk. It’s an impressive jut of red-brown volcanic rock pushing out of the snow-covered hill. Tony and I didn’t have time to climb to the summit so we explored along the ridge leading up to it. Mt. Erebus was hiding in the low overcast cloud cover, but we could see out to sea where the tanker ship was parked waiting for the ice breaker to come through and chop a clear passage to the station to bring the much needed annual supply of fuel for the cold dark winter months ahead. It was refreshing to get out see a different part of Antarctica from what we had experienced over the past three months. A cool breeze, though warmer than any breeze we ever had at the pole, reminded us we were still on the coldest and windiest continent in the world. As we walked back, Tony and I talked about the possibilities of returning to the Antarctic as well as our travel plans once we got off the ice. We recognized the possibilities were endless. The flight to Christchurch was uneventful save for the fact that as we got ready to land, we noticed it was dark beyond the porthole window. It was the first time we had seen astronomical darkness since October, and when we stepped off of the plane, the balmy New Zealand weather treated us to a light sprinkling of rain – just enough to amplify and release the amazing smells of the living world now all around us. We reveled in all of this and for days couldn’t help commenting on how great the earth smells as our olfactory senses continued to be awakened or how odd darkness felt even after we had discussed it dozens of times before. This entry is filed under: Antarctica, Hike, Snow, Story.